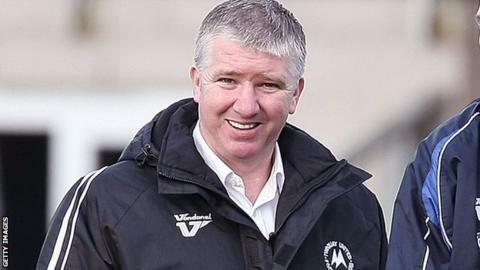 Former Torquay boss Martin Ling says he would discuss a return to the struggling National League club. Ling was sacked in April 2013 having taken time off after suffering from depression. Torquay were relegated from League Two the season after Ling left the club. "If someone there felt my coming back would be a good thing and wanted to talk about that, I'd certainly be prepared to speak to them," he said. Ling has not worked managed since leaving Torquay, but has done scouting, youth coaching and worked with footballers to increase the awareness of depression. Torquay are managerless since Paul Cox resigned last week, followed soon after by director of football Dean Edwards. The club was taken over in the summer by a consortium of local businessmen after owner Thea Bristow announced she wanted to sell the club. The new board had to cut costs, closing the Academy, reducing the playing budget and leasing part of the training ground to Plymouth Argyle's academy. "I hear so many stories about the financial plight they're in and the last manger earning no money that it doesn't sound attractive, if I'm honest," Ling told BBC Radio Devon. "But if they've got a plan in place to move the club back to where it was when I was there previously, then maybe I would be interested, but it's really for them to get in contact and tell them that they've got an interest in me to do that. It's not like I've got to put a CV in." On Tuesday the club said they had had 129 applications for the managerial vacancy with 60 being 'serious'.